For a while now, Txt2Give customers have been able to seamlessly integrate with two of the leading church management systems: Fellowship One and Church Community Builder. These integrations allow donations made through the Txt2Give platform to flow automatically into these two church management systems, requiring no intervention from staff members. Today, we’re excited to announce a brand new integration option. One that will make the lives of church administrators and accountants everywhere using ACS much easier. You can now export donations made through Txt2Give to a file format ready for ACS, in one simple click. Once your church’s Txt2Give account is configured properly in our Dashboard, you’ll be able to output a file that will import right into ACS with no data massaging necessary. We even provide a video detailing this process so you can see exactly what it is you need to do. 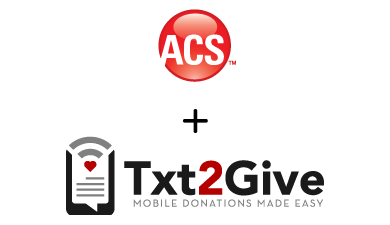 If you’re interested in learning more about how your church can benefit from text donations, and how our ACS integration works, drop us a line at hello@txt2give.it. We’d love to hear from you!